The Synodikon of the Orthodox Church is included in the liturgical book known as the Triodion and placed at the end of the sequence of the First Sunday of Great Lent, because on this day (11 March 843 AD) it was established on the initiative of the empress Theodora to be the feast of Orthodoxy in commemoration of the triumph of the Orthodox faith, with the final restoration and honorary veneration of holy icons. The first and original version of the Synodikon contained the decrees of the Seventh Ecumenical Council (787 AD), names from the Council of the year 843 AD, and subsequent local councils, but also names of various heretics who had preceded like Arius, Nestorius, Sabellius, Eutychius, etc. In later sections of the text there are condemned by local councils the heresies and heretics that arose during the later centuries (10th-14th). These were probably included in the period of Hesychasm (14th century). In any case, the final and last configuration and compilation of the current text is placed in the second half of the 14th century. Since then there has been no addition. Liturgically it should be noted that the entire Synodikon is not read in churches on the Sunday of Orthodoxy, but a very small excerpt of which is of course the inclusion of the Orthodox faith. We also emphasize that nowadays the "anathemas" are not read, which have been unstressed for at least a century, maybe more (the issue deserves special investigation). - The truly non-existent and fallen arch-heretic Pope and Patriarch of Old Rome Benedict XVI and those in communion with him, anathema, anathema, anathema. - Martin Luther, John Calvin, Henry Zwingli, Henry the VIII the impious king, and those with them, and all the heretical offshoots of the Reformation, anathema, anathema, anathema. - Those who deny and rebuke the Panagia, the consubstantial, indivisible and Life-giving Trinity, the Rabbi's of Judaism, the Islamists, the anonymous tracts of the Watchtower Society, the Jehovah's Witnesses, anathema, anathema, anathema. - Those who deny the Holy 4th, 5th, 6th and 7th Ecumenical Councils, the Monophysites, Monothelites, and Monoenergists, anathema, anathema, anathema. - Those who preach and teach the pan-heresy of Inter-Christian and Inter-Religious Syncretistic Ecumenism, anathema, anathema, anathema. The Church for centuries has not added anathemas for Papists or Protestants. The "anathemas" for the Jewish Rabbis and the Islamists are probably totally irrelevant, since they are not for other religions but for Christians who fell into heresy. Shouldn't Piraeus have anathemitized all other religions and not only the monotheistic ones, to be consistent with his ideology of the anathemas. The anathemas of the Monophysites are redundant, as the leaders of the Monophysites are included in the Synodikon. However all the additions of Seraphim give the impression of an "editor", not to mention a forger of the Synodikon of the Sunday of Orthodoxy. 1. The Church of Greece, which the Metropolitan of Piraeus is under, consciously follows the Pan-Orthodox line (after relevant Pan-Orthodox decisions) and participates in dialogue with Roman Catholics. The anathema of the Pope by a prelate of the Greek Church creates a major issue between the two churches, whether they come from either a Roman Catholic or not. Has the Metropolitan of Piraeus really expressed the anathema of the Pope to the hierarchy of the Church of Greece? Should he not separate in every way his position from the "pan-heresy" of Dialogue? 2. The same goes for Protestants, since the Church of Greece is in dialogue with them. 3. For the Jewish and the Islamist "anathemas" of Piraeus, it is equivalent to a declaration of "holy war". 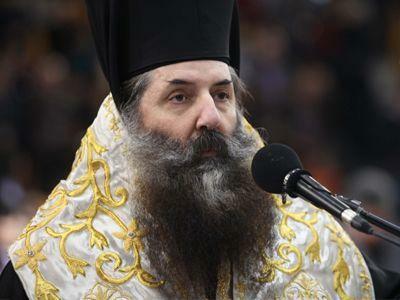 Doesn't His Eminence realize in what circumstances he may involve the Church of Greece? 4. The anathema, finally, of the "Ecumenists" and those involved in Inter-Christian and Inter-Religious dialogues by the Metropolitan of Piraeus raises a major ecclesiological and canonical problem. The Metropolitan of Piraeus, by only this, is basically anathematizing the Ecumenical Patriarchate (which has the initiative and coordination of dialogues), the Church of Greece to which he belongs (and which in a recent conciliar decision reaffirmed its participation in the dialogues), the ancient Patriarchates and all the Orthodox Churches participating in dialogues and teaching, according to Holy Piraeus, "the pan-heresy of Inter-Christian and Inter-Religious Syncretistic Ecumenism." In this sense, the Metropolitan of Piraeus essentially finds himself in a de facto schism with all of Orthodoxy, since he considers them heretical and anathema in the most formal and solemn manner, and he should clarify his position on this issue. I think that the Church of Greece is treading along dangerous paths ... and apparently silence can no longer be the appropriate attitude. Things should be cleared up before it's too late ... before, in other words, he enters into circumstances with the Ecumenical Patriarchate and other Orthodox Churches, or before our country is involved in circumstances with third world countries due to unmeasured statements and events by a Metropolitan against Judaism and Islam. Η λιτάνευση των εικόνων from pewebtv on Vimeo.